When and where can a debt collector call me? 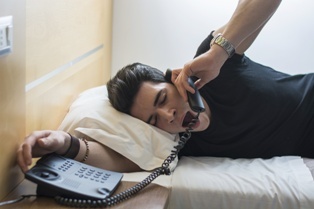 Phone calls that interrupt dinner are annoying, but calls that wake you up early in the morning or late at night are downright infuriating. When that call comes from someone trying to collect on a debt, it’s even worse. Debt collectors rely on telephone calls to reach consumers because they are hoping to persuade, trick, or bully them into paying a debt they may or may not owe. Fortunately, the Fair Debt Collection Practices Act (FDCPA) protects you from disruptive or abusive phone calls. What Debt Collection Calls Are Off Limits? Debt collectors cannot call you before 8 a.m. or after 9 p.m. They can still send emails or text messages at any time, however. Once you tell them not to, debt collectors cannot call you at work. Many workers are not allowed to take personal calls at work, or just don’t have the time to deal with a call while they are working. Once you ask the collector to stop calling you at work, they must comply. Repeated or continual calls, even between 8 a.m. and 9 p.m., are not allowed. Debt collectors cannot keep calling you over the same issue. If you have disputed the debt in writing, they must stop calling you altogether. Telling your friends, family, or coworkers about the debt is forbidden. A debt collector may call others in an attempt to locate you, but may not reveal information about the debt to them. If a debt collector violates any of these calling rules, not only can he be stopped, but he may also owe you damages. For some of our clients, this means not only is the collector held accountable for breaking the law, but their debt is wiped out! If a debt collector is harassing you, our experienced consumer financial protection attorneys can make it stop. It doesn’t matter if you really do owe the debt, you are still protected from harassment! Contact me online or call me directly at 415.802.0137 to put a stop to the abuse today!